I recently updated my web design portfolio page on this site. It now includes all work I’ve done as a sole freelancer from 2005 to now. I’ve completed 17 web development projects since venturing out on my own. 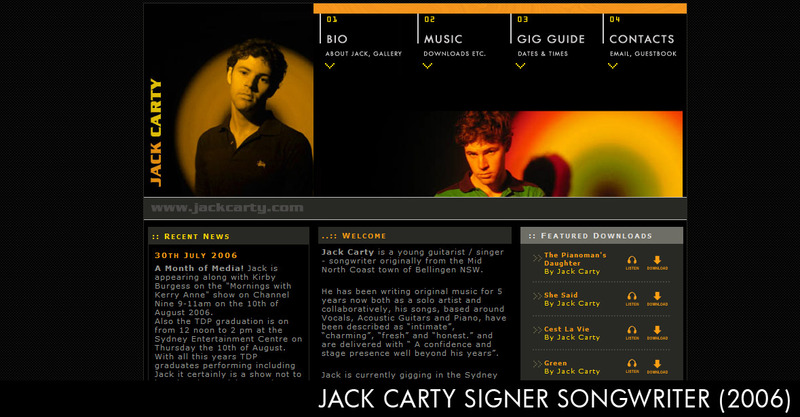 It’s hard to pick a favourite, but if I had to it would be the website of Jack Carty (singer, songwriter) this is the only site I’ve ever done where I was given free creative control with no client modifications. An absolute rarity. Everything I visioned for the site ended up in the final product. Even though it was made in early 2006, the design still holds up well today, a good 4 years later. Sadly, the website is no longer online, but there is a screen capture of it below. Jack Carty Singer Songwriter. 2006. Back in my days as a part-time contractor, over the course of 7 odd years I designed roughly 60 websites from scratch and did updates, graphic design and flash on a further 130+ sites in the client portfolio. Since I left uni I’ve full time managed content on 3 major corporate websites, including a government department, a not-for-profit membership organisation and an ASX top 50 company. Some of the sites average more than 50,000 visits per month.